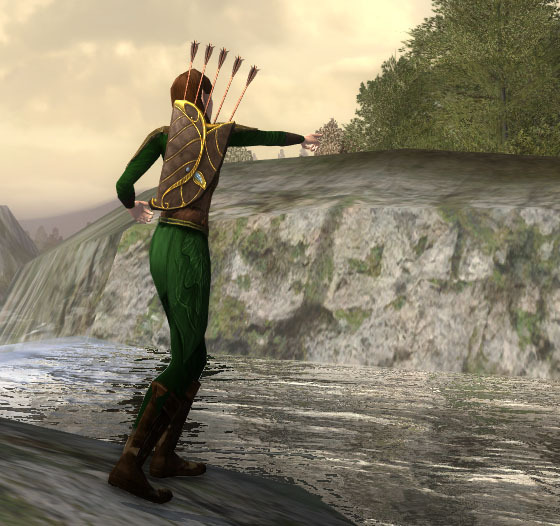 Tauriel is a fictional character from the movie The Hobbit: The Desolation of Smaug. The character does not appear in the original book, but was created as an expansion of material adapted from the book. Upon first hearing that Peter Jackson would be adding a character to the movie that was not originally in the book I was disappointed. However, after watching the movie I have to admit I love her. Her character was a truly wonderful addition to the film. 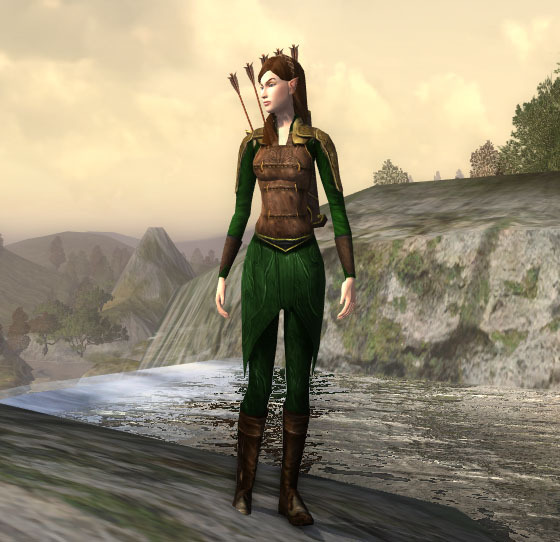 This outfit is inspired by Tauriel. 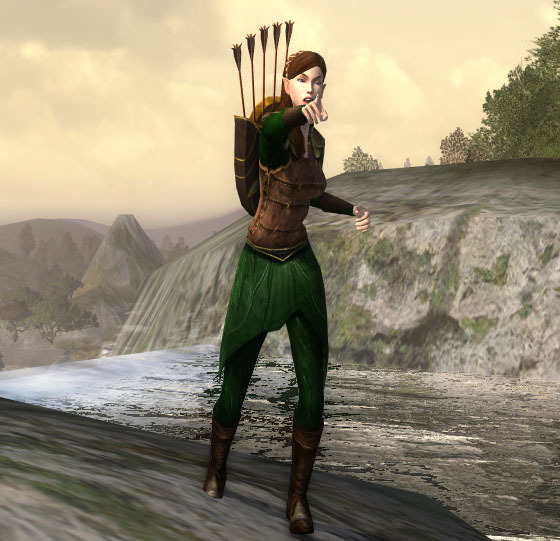 With Lotro’s limitations I could not get her outfit to match perfectly but this is my interpretation of her outfit from the movie. Well, one of her outfits from the movie. She had several she wore. I had first wanted to use the leggings, Tavol-Socas. They are an actual skirt over pants that fits Tauriel’s outfit in the movie. Unfortunately those legs have a red border at the edge that can not be dyed. I instead went with the Lore-Keeper’s Trousers. They dye beautifully and has a somewhat skirt type silhouette. 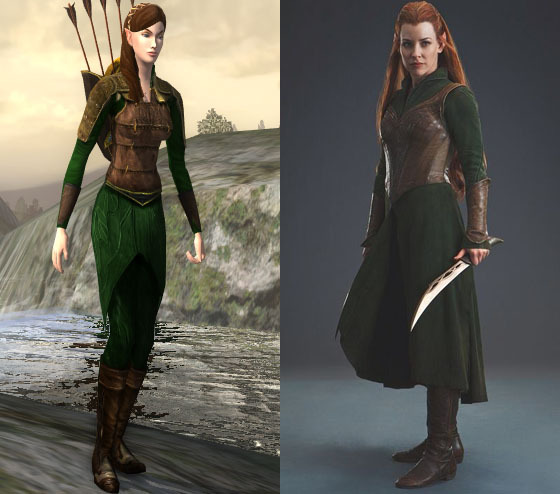 The movie outfit also had Tauriel’s quiver at her waist. 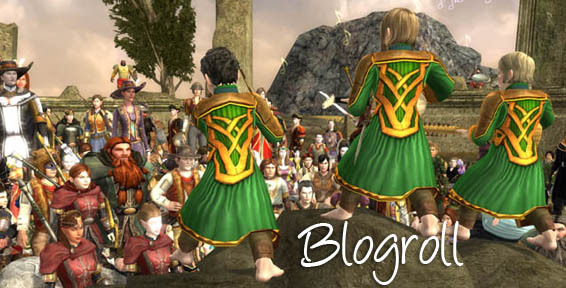 Lotro only offers quivers as a back slot item. Great job Devonna! Love your interpretation here. Oh! I’d been meaning to have a go at doing something like her outfit (we don’t get the movie until Boxing Day though, so I only have images to go by). Wonderful effort! But how to equip those items from skirm since are for different class? Thank you very much. And btw great job, I love this outfit. Keep up the good work. 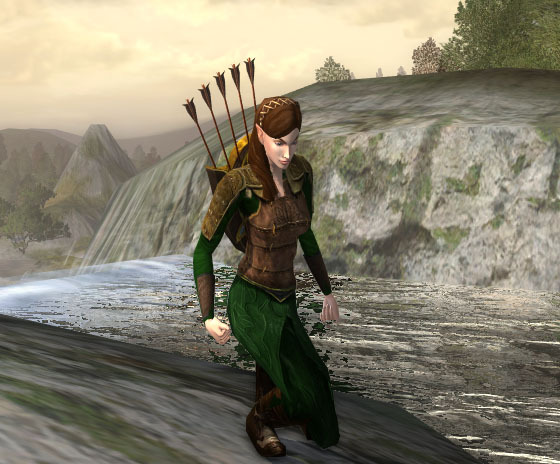 I’m trying to get your character’s hair color that matches Tauriel’s so well, but can’t seem to get it right. Where on the spectrum of hair colors does yours fall?